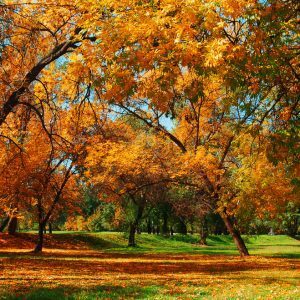 The Best Ways to Get an Awesome Autumn Backyard | Turf Etc. Seating areas give people a destination when they enter into the backyard. Opt for comfortable wooden seating that does not get cold like metal might. This offers guests a place to sit down and enjoy a book while snuggled into a flannel blanket on a chilly fall afternoon. All-weather cushions are a good choice to withstand moisture from rain and early snows. It becomes even more important to designate walkways through your backyard when autumn leaves fall. Be sure to install pavers or rustic brick paths to help guide houseguests toward strategic focal points or cooking areas. This will help streamline social events and create a feeling that your landscape is all connected. Water features are a great way to add a focal point to your backyard, even in the fall. Look for water features that are easy to use such as fountains with running water or birdbaths that will attract cardinals and other winter birds. Small wading pools are ideal for families that do not want the maintenance that comes with a diving pool. There are a variety of ways to incorporate water into your landscape design so you can enjoy the relaxing sounds of water at any time. Like water features, fire pits are a focal point in the backyard. They come in both built-in and free-standing options so you can choose the style that best suits your space. Fire pit surrounds are a great way to customize the look of your space even more by choosing pavers or a mosaic design that suits your style. Fire pits can dress up any yard and help create a scenic backdrop for backyard dinners with family and cookouts with friends. When the temperatures drop, the grill heats up! Cook outdoors this season and invite your family and friends to enjoy piping hot food out in the crisp fall weather. Offer apple cider to drink and keep freshly cut apples with salted caramel dipping sauce on hand for dessert. Popcorn makes a great snack to leave out on tables as you prepare the main course over an open flame. Soft twinkle lights for the backyard can turn any unusable space into a romantic scene. String them along the eaves of the house or along a pergola to create a subtle ambiance that invites guests outdoors. If you prefer eco-friendly options, look for backyard lights that are solar powered. Your lights will collect sunlight throughout the day and use it to generate a soft glow at night. When it comes to creating a truly awesome autumn backyard, don’t neglect your pets. A dog run is the ideal way to allow your pets some fresh air. SYNLawn Kansas City offers artificial pet turf that not only remains lush and green year-round, but also maintains a hygienic space for your pet to use at any time – regardless of the weather conditions. Playground turf installations make it easy for kids to enjoy the cool autumn weather. Children can swing or slide down to the ground while the adults enjoy drinks on the patio or join in on the fun by creating a leaf pile for kids to jump into. Our playground turf has fall attenuation up to ten feet so your little ones can run, tumble and leap to their heart’s content. Make your yard festive by decorating for fall! Include a vignette of pumpkins, squash and hay bales by the front door and place a scarecrow out in the yard by the garden. If you have Halloween or Thanksgiving décor for the house, don’t be afraid to display it in the windows or on your patio. This is a playful way to dress up your yard in a way that is appropriate for the season – and fun for all your visitors. With a few simple upgrades, you can enjoy an awesome backyard all season long. Contact us to claim a free landscape design consultation and get help creating the yard of your dreams!